Sport, people and passion are all inextricably interlinked. Take out the passion people bring with them to sporting venues and sport will be rendered as hollow as an empty wine bottle. This was reflected in abundance at the high profile opening ceremony of the inaugural Indo-Pak Punjab Games which were inaugurated by West Punjab Chief Minister Chaudhury Pervaiz Elahi at the YPS Stadium. The opening ceremony was slightly delayed but when the West Punjab Chief Minister, accompanied by Capt Amarinder Singh arrived in an open jeep at the venue and waved to the crowd, the large gathering reciprocated his gesture. Mr Elahi opened new vistas for the games when he announced that the next edition would be held at Lahore next year. Capt Amarinder Singh took it further by announcing that Jalandhar would play host to the games after the Lahore edition. The ceremony started 20 minutes late and once dusk slipped into the night, the newly installed floodlights were switched on bathing the entire stadium in lights which was a sight to behold. At an imaginatively crafted opening ceremony the predominant mood was of friendship. In fact, Mr Pervaiz Elahi spoke of strengthening of the bonds when he said “ Lok Mohabbat Val Ja Rahe Ne.” The euphoria lasted the full session as thousands of spectators, including Pakistani delegates, sat riveted to their seats watching with awe the cultural extravaganza that unfolded in front of them. It turned out to be a consciously designed agenda that cocooned the happiness of welcoming the sportspersons and other delegates from both sides of the border. It proved to be a cultural event that stretched beyond the frontiers of race and religion as people from both Punjabs mingled freely. The two-hour-long programme, assiduously planned and immaculately executed by the North Zone Cultural Centre (NZCC), also turned out to be a mirror which reflected the image of friendship and the spirit of ‘Punjab, Punjabi and Panjabiat’ in equal measure. The organisers did well to rope in the services of ace commentator Jasdev Singh who kept the spectators spellbound with his comments. By the time Punjabi singer Harbhajan Mann rendered `Aa soniya vi jag jiyundian de mele’ the excitement touched the crescendo. Earlier, the ceremony commenced with a march past and keeping with tradition, the guests arrived first with their women athletes covering their heads in cream dupattas. The Indian contingent was led by Padam Shree and Director (Sports), Punjab, Kartar Singh, with hockey Olympian Baljit Singh Dhillon acting as the flag bearer. Following Kartar Singh was Arjuna awardee Inder Singh, who captained the Indian football team many years back. All of them wore pink coloured turbans and were neatly attired. 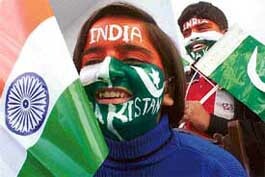 Minutes later the games flag, in which two circles were interwined depicting the two Punjabs, was brought by four Pakistani athletes before it was unfurled even as it was flanked by the flags of India and Pakistan. The torch was brought into the stadium by Kamaljit Kooner, the first Indian women ever to win a gold in the 1974 Bangkok Asian games. She handed the torch to Arjuna awardee footballer Gurdev Singh who after running a few yards gave the flame to the captain of the Indian team that won the 1975 Kuala Lumpur hockey World Cup, Ajit Pal Singh. The honour of igniting the flame went to hockey Olympian Balbir Singh (Senior), the only living player to have won three gold medals in the Olympics at London (1948), Helsinki (1952) and Melbourne (1956). Once the torch was lit, tiny tots performing the traditional Punjabi folk dances-giddha and bhangra — came out. This was followed by a tour of the stadium by a tableaux on which Shera-the games mascot — was displayed. The tableaux was brought to a temporary halt before the dais to enable the dignitaries to have a good view of it. This was followed by Barkat Sidhu and Manpreet Akthar reciting couplets of Sufi saint Sheikh Farid. Renowned sufi singer Hans Raj Hans later stepped in to welcome the guests with his rendition of “Aj koi aaya sade vehre” based on Prof Mohan Singh’s poetry. Dolly Guleria and the nightingale of Punjab, Surinder Kaur, regaled the audience while Sardul Sikandar too added to the ambience of the occasion. The piece de resistance came from Harbhajan Mann whose famous song ‘Aa sonia jag jiyundian de mele’, was lapped up by the audience. ‘Heer’ by Sardul Sikandar and Gurmit Bawa’s `Jugni’ too were loudly applauded. For the next six days, when the actual competition kicks off, the games will strive to prove that sport can surmount all political compulsions and sustain itself on its own. Prominent among those who were present to mark the historic occasion were former CM Mr P.S Badal, Mr S.S.Dhindsa and Raja K.S Sidhu, President and the secretary of the POA respectively, foreign minister K.Natwar Singh, Mr Suresh Kalmadi and Mr Randhir Singh, President and Secretary General of the IOA, respectively and Mr Shahid Sami, President of the Pakistan Punjab POA. A galaxy of former and present Olympians too were present. Politics was at play at the opening ceremony of the Indo-Pak games with former Chief Minister Parkash Singh Badal and former Union Minister Sukhdev Singh Dhindsa, who is also President of the Punjab Olympic Association, being completely ignored. Chief Minister Amarinder Singh as well as the other prominent personalities who spoke on the occasion did not mention the names of either Mr Badal or Mr Dhindsa in their speeches. Mr Badal, who had earlier claimed that he had not been invited to the World Punjabi Conference held at Punjabi University even though invitation cards had been received by his nephew Manpreet Singh Badal, today chose to attend the opening ceremony along with Mr Dhindsa. A few other Akali leaders were also seen at the inaugural function. Though the ignore given to Mr Badal and Mr Dhindsa was on expected lines, what is surprising is that senior sport functionaries of the state and the Indian Olympic Association forgot to mention the name of External Affairs Minister Natwar Singh on the occasion. All of them, including Rana Gurmeet Singh Sodhi , who is Chairman of the organising committee of the games and Chief Parliamentary Secretary, Sports, Raja Randhir Singh, who is Secretary-General of the Indian Olympic Association, and Suresh Kalmadi, who is President of the Indian Olympic Association, forgot to mention the name of Mr Natwar Singh in their speeches. Meanwhile, the opening ceremony had a surprise. Seventyfive-year-old Surinder Kaur teamed up with her daughter Dolly Guleria to sing the former’s evergreen hit “Mavan te dhian” which was well received. Dolly was seen supporting her mother who was keen to sing on the occasion. Then it was left to Harbhajan Mann to set hearts racing of Pakistan and Indian sportspersons. They broke into an impromptu bhangra to Mann’s ‘’Aaa soniya jag jeondan de mela’’.